The beautiful island is not blessed with large bodies of water such as lakes, however the country if dotted with man-made reservoirs and vast network of river systems. These rivers and their tributaries give you the opportunity to travel along these via boat or in this case kayaks. These vast riverine systems give varying levels of difficulty, going from smooth still water kayaking in the Kalaoya situated in the north west of the country to the white-water rapids of the Kelani river in Kithulgala. Being surrounded by sea you can also sea kayak during certain times of the year when the blue of waters of the Indian ocean are still like a mirror. 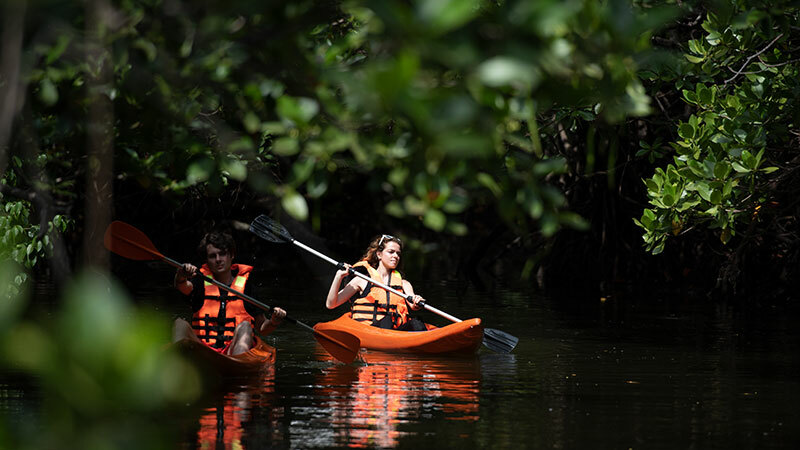 Join us at nature odyssey to enjoy specialized kayaking trips through these vast water systems, whether it be a day excursion paddling through the rainforest streams, exploring mangroves along the Kalaoya or multiday experiences such as traversing the Mahaweli through Wasgamuwa National park, exploring the Kalu river in the south or braving the rapids of the Kelani River in Kithulgala. Our team is ever ready to cater to your every kayaking need.